Alakh Yog provides an excellent Yoga Alliance US and International approved 200 Hour Yoga Teacher Training Program with the aim of teaching ancient traditional yoga with detoxification techniques to their students. Even if you are entirely new to yoga or a specialist searching to expand your practice, this teacher training course will give you immense confidence and inspiration to become a joyful and knowledgeable yoga teacher and individual. The course covers Hatha and Ashtanga Yoga with Emotional Rebalancing and Naturopathy techniques. During this teacher training program, you will be staying at Madhav Residency Rishikesh. It is a 40 room campus building with power backup and Wi-Fi. The School building is newly constructed i.e. in October 2018. There are 2 indoor yoga studios, a dining area, a beautiful SPA and rooftop. There are triple sharing rooms or private room with and without attached toilets with hot showers and a balcony. We have a washing machine and filtered drinking water facility. AlakhYog offers bed sheets, pillows, toilet paper, blanket and other basic amenities. Explore the divine intricacies of yoga in its many forms through this inspiring and life-changing program. 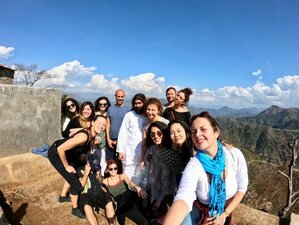 The course deals with in depth knowledge on Hatha and Ashtanga, along with meditation yoga philosophy, ayurveda, naturopathy, and spiritual techniques. This is the place where you will experience bliss and transformation. Hatha yoga is one of the oldest forms of yoga which emphasizes the balance of the body and mind. It is a way of purifying the body and awakening pranic energy which is found in ancient Indian Vedic culture. In recent years, it has become more and more popular as a great way of improving fitness levels and as a form of treatment for many ailments. The classes are based on ancient traditional yoga and lead by a very experienced teacher. The instructor will explain approximately 100 asanas in precise and thorough detail and will be teaching how to enter into a pose and how to come out of a pose, the correct alignment of poses, correct usage of props, including benefits of using props, how to assist others and correct various faults, the benefits of each pose, and other various benefits of yoga. The classes also include sequencing. During the course, there will be a strong emphasis on developing good alignment skills in each student along with the knowledge of each asana. Classes are held from Mondays to Saturdays from 06:00 to 19:00. Upon completion, you will have a yoga diploma for the 200-hour yoga teacher training, which is recognized by International Yoga Federation and makes you eligible to register with Yoga Alliance. The course is also certified by the Indian Yoga Alliance for 200-hour yoga teacher training. After successful completion of the training, you can register with Yoga Alliance. For registration, you need to login to their website, and after filling needed information, you will get registered. This course is created for individuals with aspirations of becoming yoga teachers but is appropriate for any individual wishing to further expand their yoga practice. Cultivate happiness, self-love, and positivity in a yoga program deeply devoted to spiritual growth and understanding. You will leave the program with the knowledge, experience, and confidence to become the yoga teacher of your dreams. Every teacher and staff member Alakh Yog is passionate and committed to providing the best possible experience for you. Alakh Yog School provides a spiritual environment for knowledge seekers to grow and nourish their souls. It’s a community built on love, enthusiasm, and a profound belief in the transformative powers of yoga. The Yoga Center in Rishikesh is located a few kilometres away from the busy city center of Rishikesh. The school is situated in a quiet residential society which is near AIIMS Hospital and Seema Dental College. The are is completely safe and the people are really friendly. The riverside is 10 minutes walk away from the school. There are tuk-tuks available at a few minutes walk, which can take you to the city centre or to the local market. Grocery shops, cafes, Restaurant, ATM is a few minutes walk away from the Ashram. Naturopathy and Ayurveda also focus on cooking food correctly. AlakhYog has a few lectures about the type of food to eat, the myths and healthy food habits. And throughout the month, we prepare food for our students on such principles. The menu changes every day and tries to cook with the freshest seasonal organic ingredients. AlakhYog can arrange if you have any food restrictions. Three vegetarian sattvic meals will be provided during your complete stay at the campus from Monday to Saturday. Meals will also be provided without any additional charges on Sunday, with a prior notice. AlakhYog In-House "Ayur-The Vedic Spa" offers a diverse range of Indian and international treatments to rejuvenate your body and soul. Managed by the "Ayur" Team, the spa has a qualified team of guest therapists who have expertise in traditional and international spa regimes. Our Ayurvedic spa treatments are based upon centuries-old Ayurvedic therapies that support balance and bliss in your life. The revitalizing and therapeutic treatments offered are customized to your particular needs. All therapies are natural, gentle, and delightfully pleasing. The spa also has a Sauna room and Shirodhara Table. Once you confirm your spot, AlakhYog team will be in constant touch with you advising and ensuring your smooth arrival to the School. You should search for flights to arrive at Indira Gandhi International Airport (DELHI). From where you can take a domestic flight to Jolly Grant Airport Dehradun (DED). AlakhYog can arrange your airport pick up on request. Note: You can also take a direct taxi from Delhi airport to Rishikesh. AlakhYog can assist you in arranging the taxi. The fare is around 3500 - 4000 INR. The main bus station in Delhi is ISBT (Kashmiri Gate). From there you can find many government and private transportation to bring you to Rishikesh. It takes 6-8 Hours by bus. Once you arrive at Rishikesh bus station, you can take a shared tuk-tuk or AlakhYog can arrange your pick up to bring you to the yoga school. The nearest railway station is Haridwar train station. It takes 6 - 10 hours. From there you will find many buses, taxis and other transportation services that will bring you to the school. If you want, AlakhYog can arrange your pick up from the station on request. Airport: Indira Gandhi International Airport Airport transfer available: Indira Gandhi International Airport (US$1 per person) Additional charges may apply. You can request this in the next step.